Scheduled to open in early spring, 2020, Camarillo's flagship hotel will become a center of activity. Ideally situated with access to the Camarillo Premium Outlets and Camarillo's commercial core, the hotel will attract business guests, conference center users, shoppers, travelers, and others. Also part of the hotel is the conference center. Recognized as a priority need of the city for several years, this 17,500 square foot space will have the capacity to seat up to 750 guests in a single (divisible) space for large-scale conference events. This facility will serve an unmet need for the community, supporting events in Camarillo, at California State University Channel Islands, and throughout Ventura County. Likewise, the divisibility of this space ensures its flexibility, allowing for weddings and other smaller-scale events. Mian Plaza is offering for lease a number of highly visible spaces adjacent to the two hotel buildings. With these spaces, you will be able to take advantage of a captive audience! The site has been carefully designed and laid out to create a synergistic relationship with the surrounding uses. 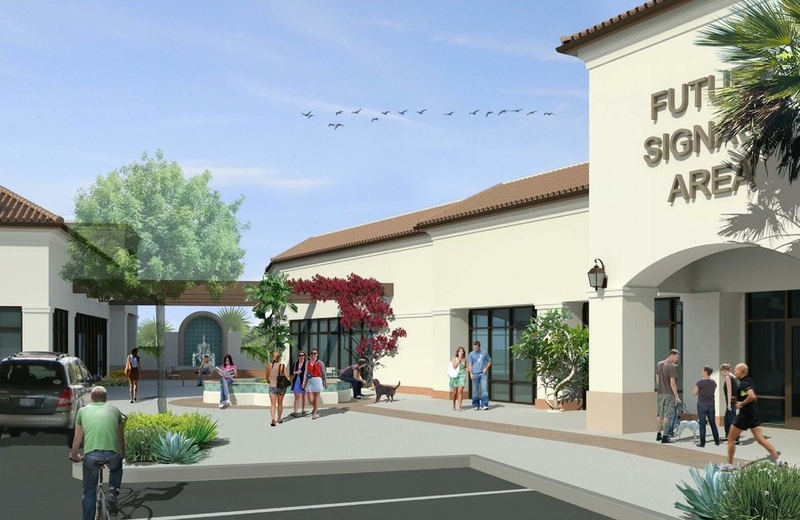 The hotels will face the Promenade, part of the Camarillo Premier Outlets. This will draw hotel pedestrian traffic between the two sites, and the pathways have been designed to draw users past the retail spaces. Additionally, located strategically between the 101 Freeway, Las Posas Road, and Ventura Boulevard, you will enjoy vehicular visibility in addition to local pedestrian traffic. Furthermore, additional development is anticipated within the immediate surrounding area. These users will draw regional traffic that will supplement the hotel guests, providing your business even more exposure. Contact Us Now to explore leasing opportunities! For more information on lease space within the hotel or retail buildings, please complete the below form and somebody will be in touch with you.